A glorious soundscape within a fresh and embracing landscape was my reward for Stage 6 walking along the Derwent River. As I left the bus and began to walk along the marked gravel pathway nearby, a sulphur crested cockatoo screeched overhead. 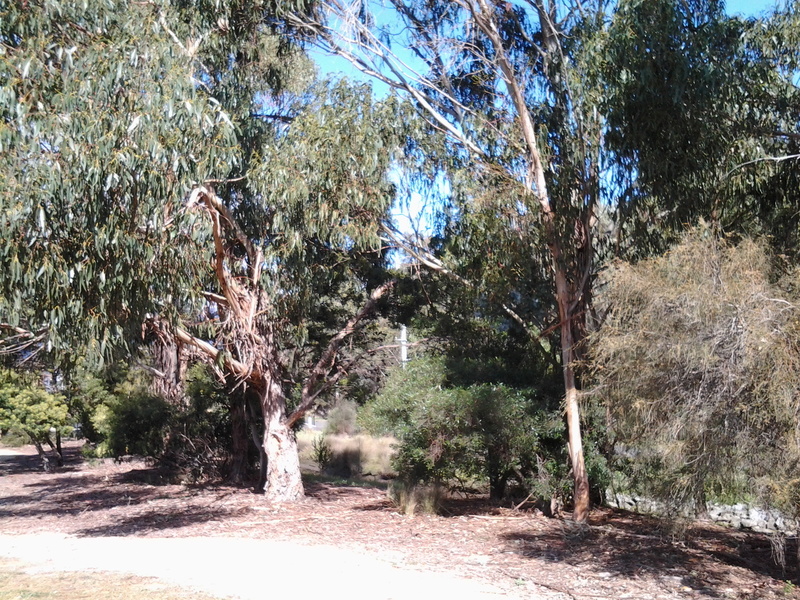 It was easy to enjoy the sunlit stand of poplar trees then Peppermint gum trees and other vegetation surrounding me. 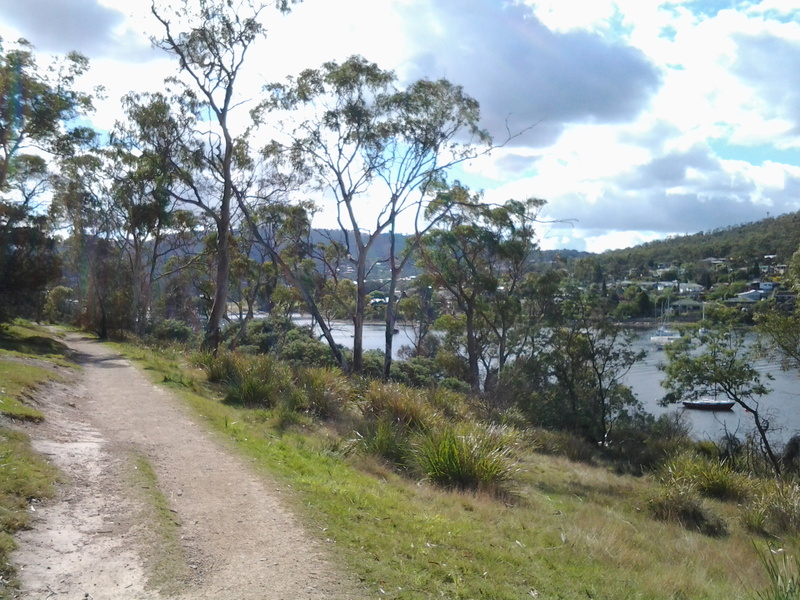 Geilston Creek, with its paddling ducks, wound its way towards Geilston Bay on my right. The further I walked the more bird song I heard and the more native birds showed their colours. First I noticed a pair of pardalotes, then Jenny Wren and her mate the divine Blue Wren both collecting a meal of insects from the path ahead. To my left were sports ovals and tennis courts. 10 minutes after leaving the bus I reached a new walking bridge over the creek near the edge of Geilston Bay, garlanded by large flowering wattle trees at the entrance. Once over the bridge I turned left onto a road, with a series of dinghy lockers visible on the other side of the creek, then a couple of minutes later the Bay was clear on my left and the last houses before the bush started were located up on the right. The track to Shag Bay started 15 minutes after I left the bus. Despite no breeze I felt the cold air hard on my face. But the air was deliciously clean, the environment pristine after the rain overnight, and the tranquillity of the vistas was sublime. 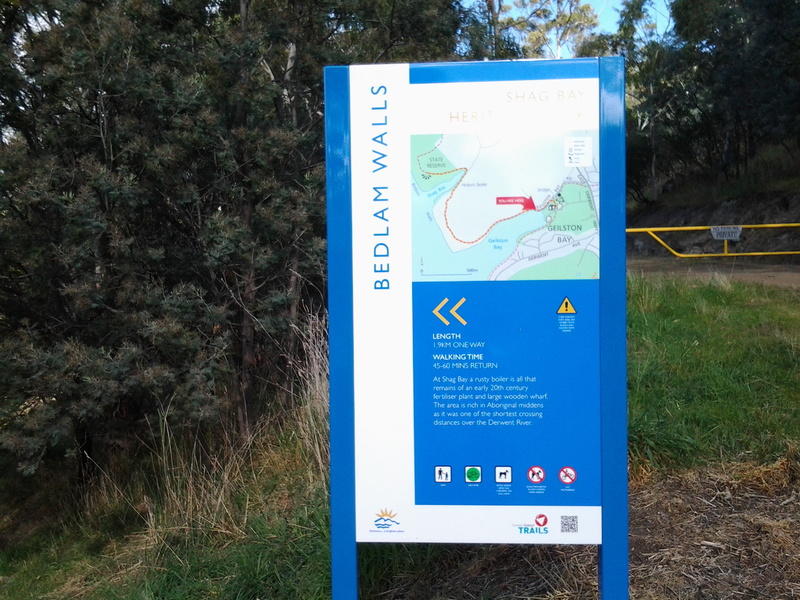 The official sign in the photo above, which was located at the beginning of the track, includes a map showing the way to Shag Bay and on to Bedlam Walls. I trekked gently uphill parallel to Geilston Bay on an undulating gravel track and around me all manner of birds sang, whistled, chirped and squawked. An ornithologist would be able to identify those sounds, but mostly I needed to rely on seeing these feathered friends of the bush. The sounds were inspiringly musical. It was a feast for the ears. I spotted a Black Faced Cuckoo Shrike. 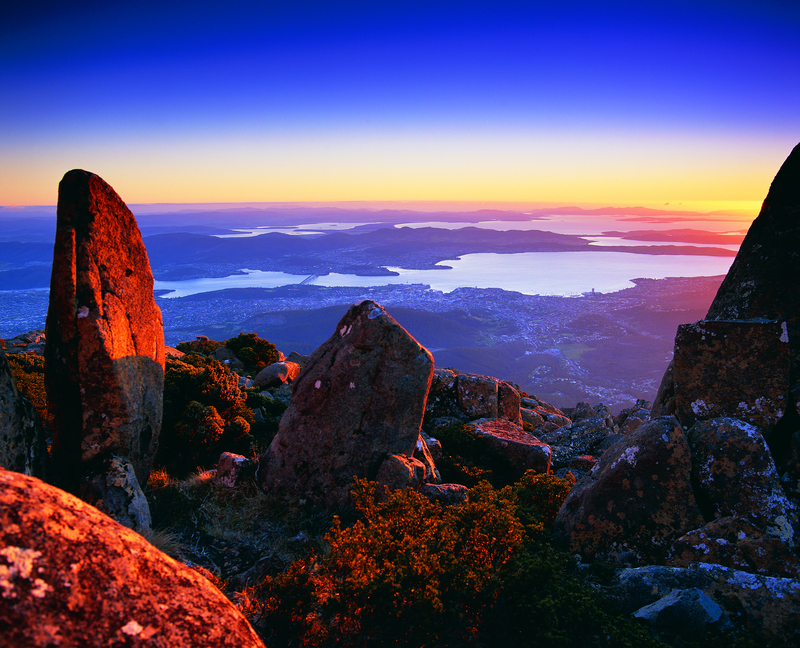 The photo above show where I had walked from: it looks down the track with Geilston Bay on the right. At 10.05am I reached a split path and took the left hand route. The occasional gum tree was surrounded by open grassland containing frequent clumps of one of our native plants the Diplarrena Moraea, spiked with their white blooms. Tree roots slithered across the path creating a tripping hazard, so I walked slowly in order to absorb the views. At a second split in the path, again I took the left hand track. This meandered downhill on slippery gravel under old Casuarina trees to the water’s edge. At 10.10am I stood on the rocky shore at Bedlam Walls Point. From the foreshore at Bedlam Walls Point, I looked across the Derwent River northwards to the industrial business ‘Nystar’ which edges part of the western shore of the river; a large zinc and lead smelting and alloying operation. The photo below is also taken from Bedlam Walls Point and looks southwards. The headland on the left is the Lime Kiln Point marking the other entrance into Geilston Bay. Further afield the Tasman Bridge spans the Derwent River. Before I left the Point, I watched a few pieces of river traffic: cormorants diving for their fish dinners, the MONA catamaran, fishing boats, and the sailing yachts. Generally tranquillity reigned. 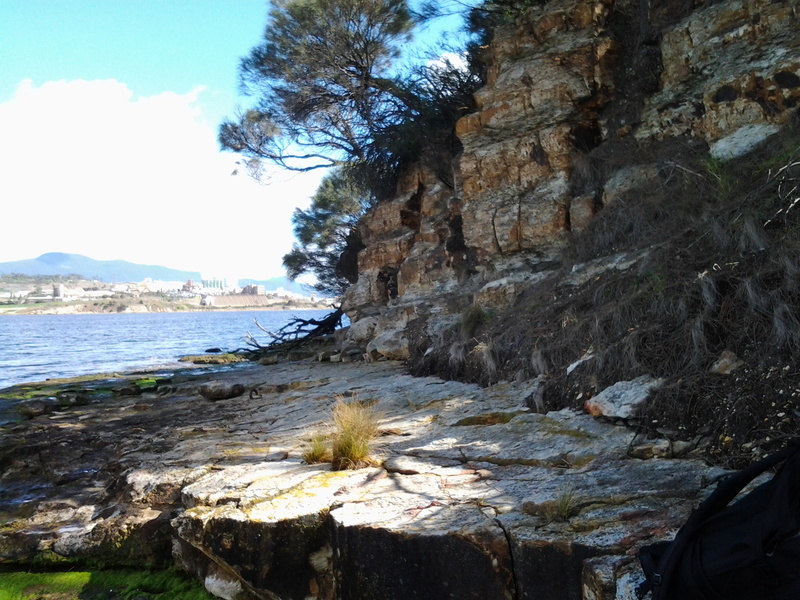 Then for a while, I walked the rocky edge back into Geilston Bay a little then retraced my steps again to walk around the Point and along the Derwent River edge hoping to find the cave. Once it was obvious success with this search wasn’t likely, I clambered up the hill. By 10.25am, I was standing on top of a cliff on a little used unofficial track. I continued to walk along northwards and up the gentle hill with the intention of rejoining the official track. Before then, however, I came across an infrequently used 4 wheel drive ‘road’ and followed this instead. The main path was only 20 or so metres further inland. By continuing on the ‘road’ I walked closer to the River and found the experience very pleasant. There were no other people, and no signs of native animals. Only beautiful bird song. 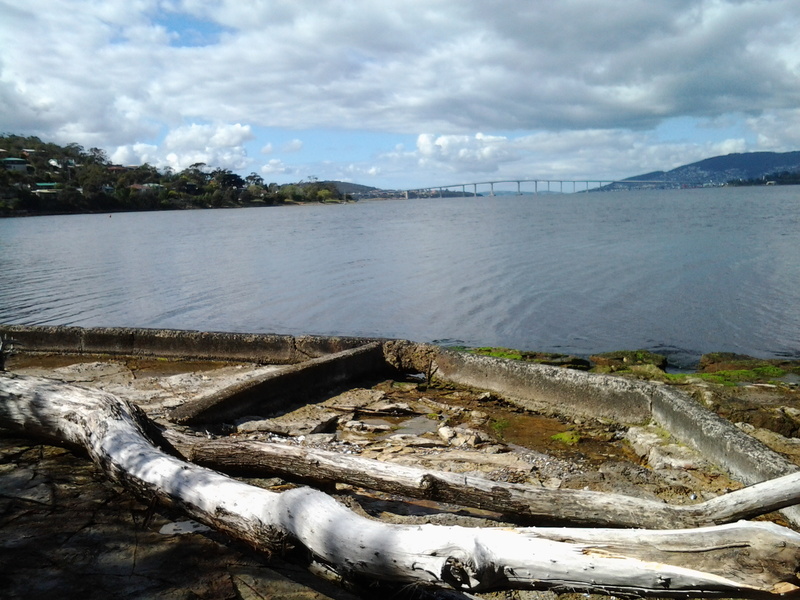 This entry was posted in Derwent River, Hobart, Walking and tagged Bedlam Walls Point, birds, Geilston Bay, Geilston Creek, Lime Kiln Point, MONA, Nystar, Parks and Wildlife Service Tasmania, Shag Bay, Tasman Bridge on October 18, 2014 by Tasmanian traveller.